While the title is HACK 1000 miles, where or when you hack is completely up to you! Balancing your time is key when you have horses: between work, family and mucking out there isn’t always a lot of time for much else. Here are a few people who have multi-tasking sorted – adding the miles with a little more than just your standard hack! Aiming for a particular distance can help you to keep motivated to get on and ride out. Elanne Christie and her daughter competed in a 26km ride at Darnaway, Morayshire, but a wrong turn took them for 31km instead! TREC is good both for boosting your mileage and helping to grow your horse’s confidence in tackling tasks. Practising at home is important to make sure you are as prepared as possible for any tricky questions thrown at you during the competition. 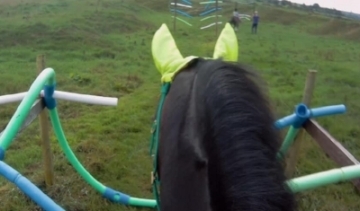 There are plenty of easy ways to construct your own DIY obstacles, as Anne-Marie Cronin shows by making use of her washing line! Getting out and about can be frustrating when you don’t have a lorry or trailer. But it is more than possible, as Sarah Blake adds miles to her total by hacking to dressage competitions. Taking part in a fun ride can be a confidence-building introduction to large rides and a great way to raise money for a good cause. Mel Newman took part in her first ever sponsored ride with her daughter this year, adding 15 miles to her total – her longest ever ride! For those of you out there seeking unusual and unique ways to get your miles in, why not take a trip out to an adventure park? Tammy Goldstein visited CHAPs with four friends, and came back with “a braver horse to take out on our next hacking adventure”. Liz Roskell visited Aventure Neighground, and took on some very scary pool noodles! Karen Simons-Musilova has been taking her pony Roo out on hacks – or should we say Roo has been taking her!